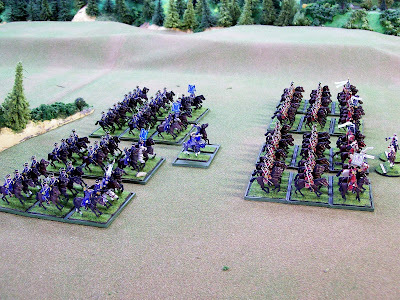 CAMPAIGNS IN GERMANIA: Saxon Cavalry Brigade Exercises And? Saxon General Major von Nostitz's Cavalry Brigade exercises near Lobositz, Bohemia. He was recently ordered to assemble there with a larger Imperium Army whose mission is to counter an expected appearance by Frederick II of Germania. 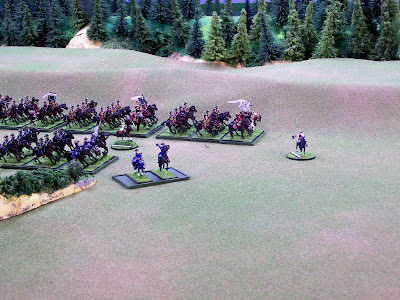 Von Nostitz is centered between two four squadron regiments of Saxon cavalry. To the left is Dragoon Regiment von Brühl. To the right is Chevauleger Regiment Rutowski. They come closer in two columns of squadrons. 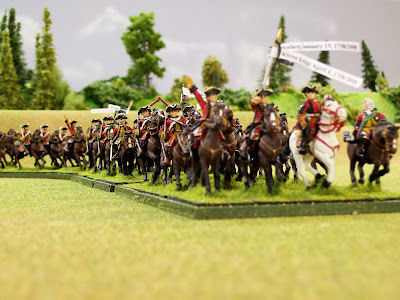 Most castings are 28mm Elite Miniatures with a sprinkling of Front Rank officers for variety. Von Nostitz is a late 1970s 25mm Mini-Fig in service since then. The ADC leading the Rutowskis is a familiar RSM. 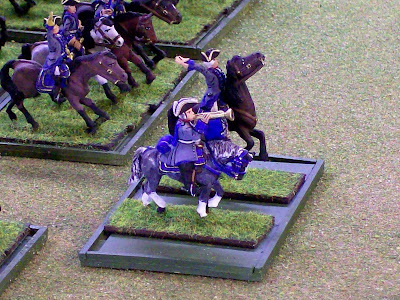 Von Brühl's bugler is a 28mm Front Rank WSS casting. Adding miniatures from multiple ranges often work and fit nicely. The Rutowskis. Apparently the regiment rode heavy horses. 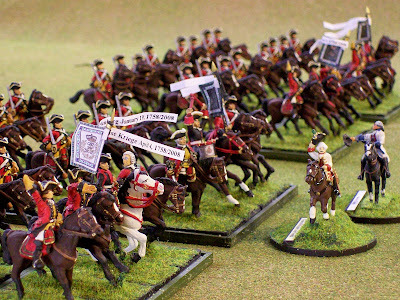 Thus, instead of rating them on lighter horses as one might expect with chevaulegers, this regiment is heavy horse. 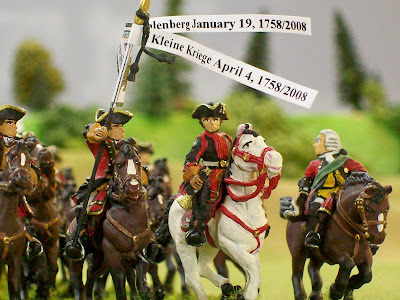 The Rutowski's won two battle honors (honours), Mühlenberg on 19 January 1758/2008 and Kleine Kriege on 4 April 1758/2008. In our system two such awards raised the regiment to elite. The squadron officer looking backwards is from Front Rank. He blends in well, don't you think? "SQUADRONS! LEFT WHEEL INTO LINE. The regiments form a traditional two-deep line in echelon ready for anything Frederick may throw at them. A closer view of the WSS Front Rank bugler. I left the buttons on the coat all the way to the hem as a special signature for the regiment. Von Nostitz inspects the Rutowski Chevaulegers. Can you find the Front Rank Montcalm? 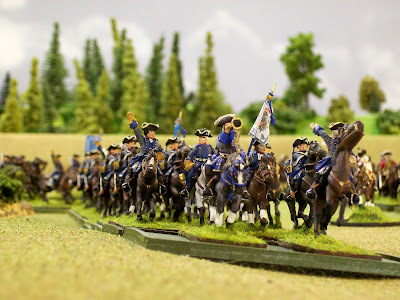 Von Nostitz next inspects the von Brühl Dragoons. The white flag signifies the senior squadron. Von Nostitz bellows, "SOLDATS, FORWARTS!" The brigade moves forward at a walk. They accelerate to a canter. Now at the gallop. 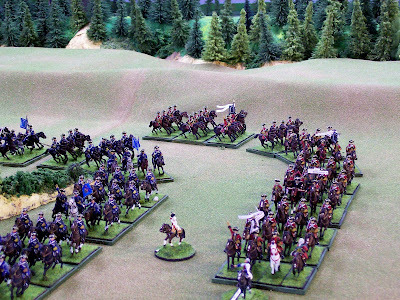 The rules have three cavalry speeds. It is important to learn when to be at each speed. Will they engage Frederick someday? Yes! At Little Wars: Lincolnshire, Illinois USA Marriott Resort on 7 February at 11am. Lobositz Scenario Design: Der Alte Fritz. 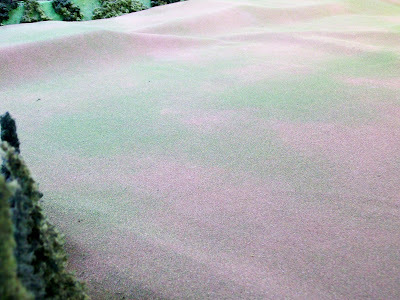 Winter Terrain: Der Alte Fritz and HG Walls. Rules: Batailles de l' Ancien Régime 1740-1763 known as BAR by yours truly. 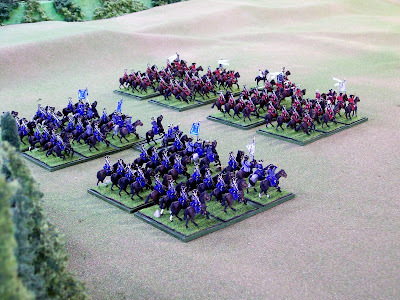 Austrians and Saxons versus the Prussians. Judges: Randy, Jim and yours truly, Bill. 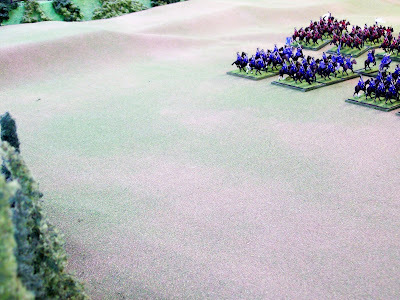 The Saxon Brigade disappears. Lobositz beckons. Both regiments were painted gradually in a two-year period. Other things were painted in between and in other time periods. We've been building our forces from much smaller collections since 2005. These are magnetized and then placed on convenient underlying movement trays. This system makes it easy for you to try different rules without needing to rebase! It also allows easy casualty record keeping. No paperwork. Just count the fellows left. 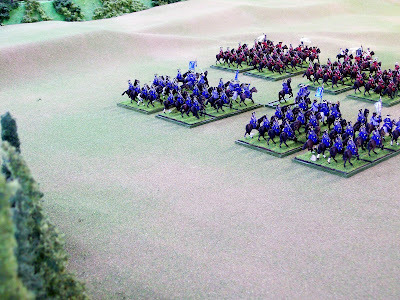 Do you need to raise large units like these to enjoy the rules? NO! You can do all this OR something similar too. Great-looking figures and wonderful care taken with the terrain and backgrounds to make a splendid viewing experience. I particularly liked the photos showing the wheeling by squadrons into line. We expect a well-photographed battle report now . . . just to warn you . . . so take lots of pics. Great looking regiments! Their evolutions are strictly "by the book" but will they prevail against the Germanian horse? I guess we'll see in a couple of days. Wish I could be there. Be still my heart! Is there a more rousing way to start the day than various well-composed photographs of BIG cavalry regiments? I can't wait to see more here. Enjoy your game! An excellent new site and some v interesting photos. Can I please ask a question about BAR. 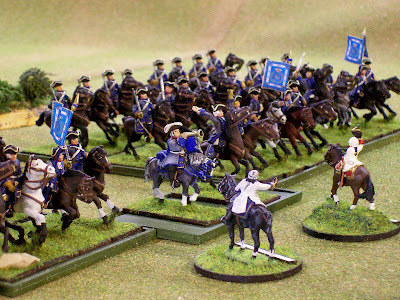 I have resisted for ages the urge to start a new scale as I have collected Revell plastics for the Prussians and the Austrians/Reicharmee but I have decided to buy 'small' forces for the French and English using the MInden miniature range. The rule book explains the make up of a french regiment but could you give a suggested figure breakdown for an English regiment using as a guide 60 figures. Super photos and inspirational in nature! A prodigious thank you, for: Bill, Jean-Louis, Jeff, Jim, Stokes, Guy and Alan. We sincerly appreciate your remarks. 4xGrand Divisions of 12 miniatures = 48. Bill very nice Photos. I can not wait until the game. Wow. Awesome photos, Bill. You've done a fantastic job of the site so far. Wish I could be there for the game! A question, on the senior squadron flags and your cavalry composition. 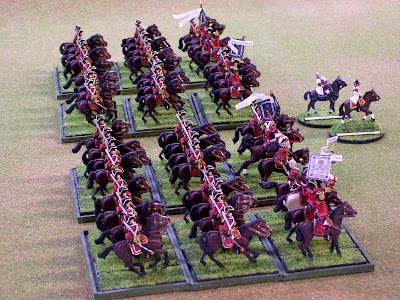 Am I right that I see a two-figure "command stand" for each regiment, in addition to its cavalry squadrons? And is the senior squadron flag always white, or is that a "colonel's colors, national colors" sort of thing like infantry battalions? My Saxon flags come from Hinchliffe and are Napoleonic. They look pretty close to the SYW era so I used them. In the SYW the Elector of Saxony was also King of Poland. This is not really your answer but since the Hinchliffe flags come with two differently colored flags, I'm using them as the King and Colonel's flags. It is my recollection that three Saxon cavalry regiments were in Poland when Frederick invaded Saxony in 1756; Rutowski, von Brühl and Prinz Albrecht. That is why and how they got away from the disasterous capitulation at Pirna in the autumn of 1756. The two extra von Brühls out in front may compose an eventual four-man command group and/or be posted into the future horse grenadier company coming from Eureka hopefully this year. I doubt I'll be able to use Eureka's beautiful but much smaller horses. I'll put the riders on larger mounts from Elite or Front Rank I suppose. 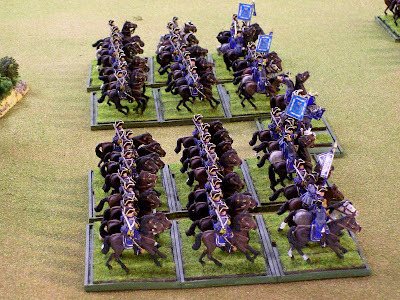 My von Brühl horse grenadier company will actually be squadron sized at 12 troopers. Hopefully Eureka will have them in the familiar fusilier hat shown in regimental illustrations. When writing about Austrian cavalry regiments, Duffy mentions extra officers rode on the flanks to pin in the troopers so they would not veer right or left of where they were supposed to be going. I kind of like doing that for the look of it. Having a command group as above and to also throw into hand to hand combat has its appeal but it need not be done. It's up to each of us to decide that. Well done to all of you gentlemen. What a super display of cavalry. I have a soft spot for the SYW Saxony troops, my own versions of the above units are 12figs strong each, I feel they look small now ! Thank you Greg and Allan! One of the things I found rewarding and easy was to take existing units and add to them. Allan, in your case, taking your 12 man regiments to 18 or 24 each might be a fun project to consider. I did this with my ECW forces about 4-5 years ago and when Der Alte and I started gaming togeter in May 2005. The same happened to my existing SYW units. 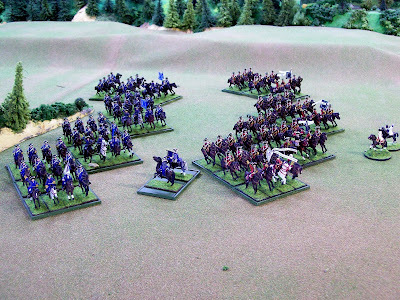 In 2008 I took a 30 man battalion of Grenadiers de France and beefed it up to 60. It had been at 30 for years and based for another rules system. 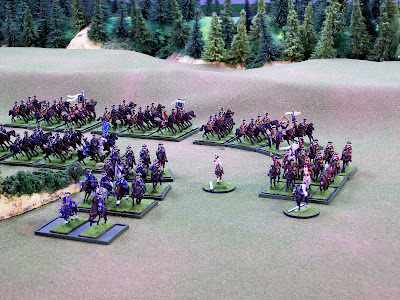 The von Brühl regiment pictured above was not painted all at once by me. The first squadron I think was done about one year ago. I then paused and painted the second a few months later. The third was painted just before July 2008. The fourth was painted in January 2009 after a six month pause. A thirteen month project with pauses to paint other stuff and in other time periods too.